If you install the TweetMeme plug-in on your WordPress blog, a button will appear at each individual blog post so readers can share the links to that post with their Twitter followers. When readers click the button to share on Twitter, it will automatically tweet the blog post’s title and a shortened link. 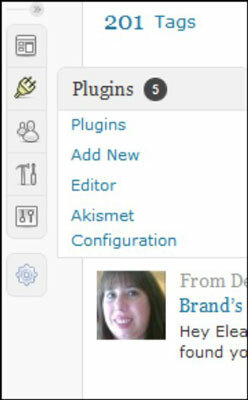 Click the Plugins icon (it looks like a little plug) in the left sidebar and choose Add New from the pop-up menu. The Install Plugins Search page appears. Type tweetmeme in the Search text box and then click the Search Plugins button. The Install Plugins Search Results page provides a list of results with the name, version, user rating, and description of each plug-in. Find the TweetMeme plug-in in the list of results and then click its Install Now link. 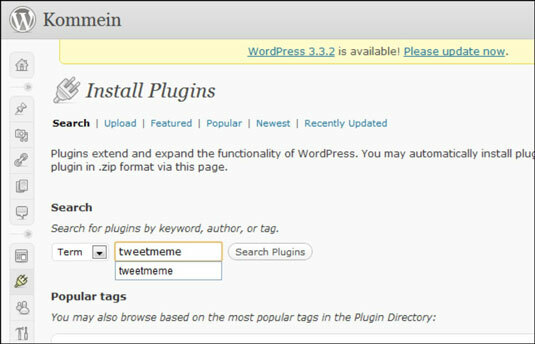 After your plug-in is installed, you need to return to your WordPress Dashboard’s Plugins page (click the Plugins icon in the left sidebar and then choose Plugins), select the TweetMeme plug-in, and configure it. You’ll need to enter your desired Twitter handle in order to receive retweets. Now you just need to determine where to place the share button, such as at the top, bottom, or side of your posts. Most people find success having the Retweet button at the top of their blog posts or floating along the left sidebar.